My Grading Challenge. I meet all kinds of students in my classes. Many are seniors who enroll in whatever Gen. Ed. courses fit their schedule. As a result, some students are interested in the subject; others have no interest at all. Some students want an A; others just need to pass. The courses are writing-intensive, but few of the students see themselves as writers, with majors ranging from accounting to zoology and everything in-between. They might love to read, or they might see reading as a monumental chore. You get the idea: diverse students, diverse goals. So, I need a grading system that respects those differences. The Solution: Choices and Points. Each week, students choose the assignments they want to complete. They do one or two reading assignments (there are lots of reading options to choose from), they write a story of their own, and they leave comments on other students' work. They also work on their semester-long project. As they finish each assignment, they complete a "Declaration," a true-false quiz consisting of a checklist. When a student answers "true," the points go automatically into the Gradebook. I do no grading; all the points for all the assignments are recorded by the students themselves. Some students may be aiming for an A (more points), or for a B or a C (fewer points); that is all up to them — not me. My Role: The Coach. Because I put myself outside of the grading loop, I can focus all my efforts on feedback and encouragement — on teaching, not grading. I provide detailed comments each week on the students' writing, and the students use those comments for future revisions. The comments are not a grade; instead, they are meant to help the students become more confident and skilled as writers. The students are also coaches, commenting on each other's work every week. We are all working on our writing, not thinking about grades. 1. The grades are objective. 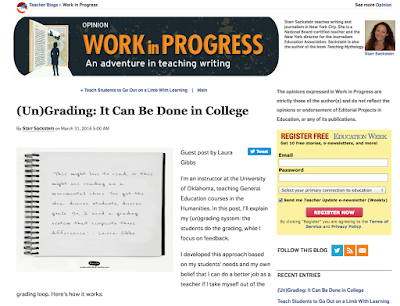 Students know exactly why they get the grade that they do: they manage the grading, and they have no grade complaints at the end of the semester. They might complain that the class is a lot of work, or they might complain about some other aspect of the class (which is good: I need their feedback!) — but there are no complaints about the grades, and that is a relief both to the students and to me. 2. The system is simple. Students do the work or not; they get the points or not — it's that simple. At any moment of the semester, students know exactly where they stand. 3. Grades are not a judgment. Students know that they can choose to work towards an A or B or C for their own personal reasons. An "A" student is not a better student than a "C" student, and getting a "C" in the class is not a punishment. A student might decide to take a "C" for their own reasons (heavy workload in their major classes, other life commitments, unforeseen events of all kinds), which is fine. As long as students pass the class, they are making progress towards graduation — and that's the goal! 4. There is no grade anxiety. Grades can be a terrible source of anxiety for college students (just ask them; they'll tell you), and if grades are making students anxious, they are not going to do their best learning. Removing anxiety about grades can refocus their attention on the learning itself. That goes for teachers too: I know I am a better teacher because I don't have to spend time worrying about grades. 5. The system promotes good time management. The assignments are meant to be completed in a single work session; some tasks might require 15-30 minutes while others might take an hour, but not more. I hope that as students see the benefits of this iterative, task-based approach, they can apply that same strategy in other classes where there might be only a few high-stakes assignments which the students must segment and schedule on their own. Are there drawbacks to this system? Of course there are: if the grade is what goes on the transcript, students will think of the grade first and the learning second. I would far prefer to use a pass/fail grading system combined with portfolios of student work, thus highlighting the work itself, not the letter grade. Realistically speaking, though, I don't expect to see an end to ABCDF in my lifetime. I am just glad that as a college instructor I have the freedom to design a grading system that can minimize the damage grades can do. If you'd like to learn more about my (un)grading system, I've collected some materials at Grading.MythFolklore.net, including comments from my students. And if you have questions, let me know; this is an important topic that I am always glad to talk about! You can find me at Twitter (@OnlineCrsLady) or by email: laura-gibbs@ou.edu. How do you know when a student answers "True" that it really was "True"? I trust them. The work is all visible in the blog network, and other students are visiting their blogs and reading and commenting on their work, and I am also; they know that what they write matters. It's quite different from when the work is just destined for the trash can (as in so much schoolwork, sad to say). When you know you are going to be sharing your work with others, it's quite different than just taking a test. For some students, that's quite unnerving at first, because it is very different from other classes: you are not doing the work just to get the grade; you are doing the work to share it with others.